There is one girl who has been stealing the show at the rhythmic gymnastics in Moscow. 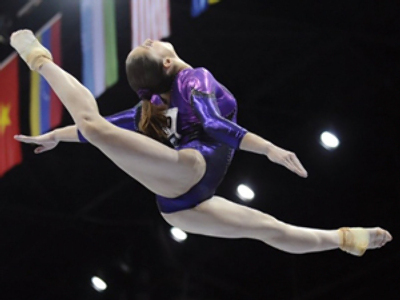 World and Olympic Champion Evgenia Kanaeva claimed all four golds in the latest leg of the grand prix series. The pressure was on Kanaeva to deliver in front of the partisan home crowd as the sport's leading lady presented her brand new program on the mat of the Luzhniki arena. 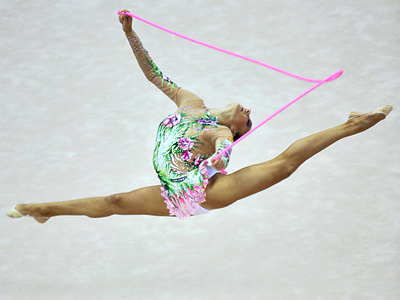 Kanaeva was as good as impeccable with the hoop, ribbon and the clubs. Though she did falter while performing with the ball, the slip-up was not bad enough to strip her of another gold. So there was no rival for Kanaeva in Moscow with only fellow Russian, Aleksandra Merkulova coming close. She claimed two silvers for her effort with the ball and the ribbon. However, Kanaeva says more work needs to be done if she is to carry her form into the London Olympics next year. “I’m not very pleased with how I performed today. I made a mistake with the ball – that’s because I haven’t had enough practice with my routine yet. As for the other pieces I only committed minor errors, which only my coach and I would have noticed,” she said smiling.